When it comes to choosing a new shower door in Houston, there are a few factors to consider if you want to make the right purchase. You will want a shower door that efficiently serves its purposes, improves the visual appeal of your bathroom, and does not cost you too much money. Keep reading if you need help deciding between a framed and frameless shower door. Just like any other fixture, appliance, or component of your bathroom has a purpose, your shower door has one as well. Your shower door is charged with the responsibility of keeping the water that pours from your showerhead inside the shower area. If your old door did not do a good job of this and you often stepped out of the shower to find the floor soaked in water, you may want your shower door replacement to have a frame. 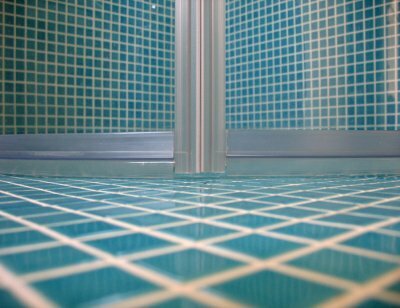 Doors with metal frames tend to be better equipped to prevent water from spraying outside the shower area. These kinds of doors come with sweeps and seals for this very purpose, so you can enjoy a dry bathroom floor after every shower. Although framed doors can be excellent for the purpose of keeping your bathroom puddle free, homeowners also tend to be concerned with the aesthetic appeal that their bathrooms offer. In this case, your shower door can make a big difference. It is not impossible to find a visually pleasing framed shower door, but in this case frameless doors tend to take the advantage. Frameless shower doors are available in a variety of styles, sizes, and design options to fit an equally expansive array of bathroom themes. They can contribute to a more open aesthetic and are often found in luxury bathrooms. If you are shopping for a shower door replacement, the ideal door will balance purpose, looks, and price. You will typically find that framed models run cheaper than their frameless counterparts since they do not require specialized parts or heavy polish. It is also worth noting that you may spend more time and effort on maintenance if you choose a frameless door. Cleaning your shower doors in Houston may not be the most exciting task, but there are treatments that can make cleaning your frameless shower doors less tedious. EnduroShield is one such treatment that aims to make your shower door maintenance easier. Continue reading to find out how EnduroShield can save you time and money. Between soap scum, mold and mildew, and mineral deposits from hard water, glass shower doors tend to see a great deal of grime. EnduroShield was designed to ward off all of these elements by coating your shower doors and protecting them from both oil and water based stains. You can then easily clean your shower doors using microfiber cloths or solutions comprised of household cleaners and water. With EnduroShield, you can clean your shower doors efficiently without having to spend money on extra strength cleaners. This treatment only needs to be applied one time and may be used on old shower doors or shower door replacements. If you are particularly environmentally conscious, you will enjoy the fact that this treatment enables you to clean your doors without having to worry about the toxicity of heavier cleaning agents. Once you have found the perfect glass shower door replacement in Houston, you will want to keep it clean at all costs. Regular cleaning and maintenance will ensure that your shower door is as visually pleasing as it is high-functioning. 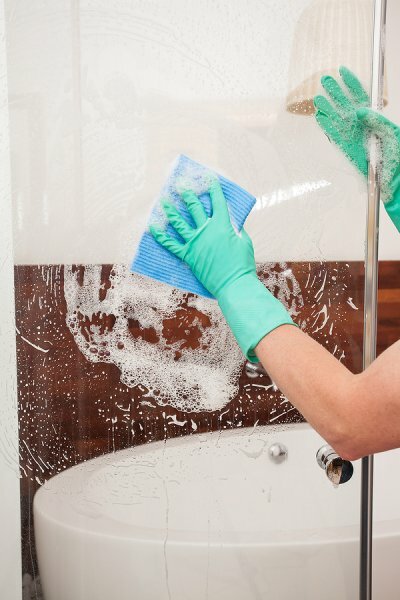 Read on to learn about the process of cleaning your new glass shower door. Whether you have a traditional shower door with a frame or a fancy new frameless shower door, you will want to take care of it either way. Mold and mildew are not only eyesores, but they also have the potential to compromise your health as well as the health of your family; this threat is amplified if you are allergic to this type of fungus. Fortunately, mold and mildew can be easily removed in most cases. Spray the dirty area with either hydrogen peroxide or chlorine to kill the mold. There is no scrubbing necessary; just spray the solution onto the area and wait for the fungus to be killed. You can make sure that you do not have this problem again by leaving your shower door open when the shower is not in use. This allows air to circulate throughout the shower area. Soap scum may not be harmful to your health, but it can prevent your shower door from looking as clean and fresh as it should; thus, it should be cleaned away. Coat your glass shower door in white vinegar using a sponge, and continue to add fresh coats as previous layers dry. Your door should remain covered in wet white vinegar for five minutes or more so that the film of soap scum will fully melt. You can then remove the remaining vinegar with warm water and shower away the smell of vinegar. 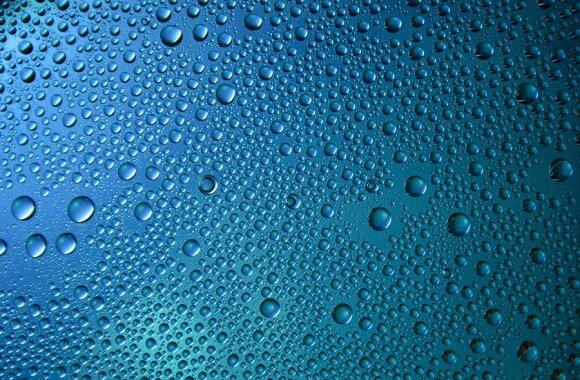 In addition to cleaning soap scum, vinegar is also useful for water spots that are left behind from hard water. Mix vinegar and water and apply the solution to your shower door. You can then consider coating your shower door in car wax to protect it from future water spots. After you schedule a mirror replacement , you can keep your mirrors looking great by practicing proper cleaning techniques. For example, you should be sure to always clean a glass mirror using a dry towel. As you are cleaning, you can prevent streaks by working from the bottom of the mirror to the top. A glass company located in Houston can help you design beautiful new mirrors for your bathroom. If you are planning a bathroom remodel, a glass company can also provide you with new shower doors that are constructed out of high quality tempered glass. To take a look at some helpful tips for cleaning a bathroom mirror, be sure to check out this video from expertvillage.